The most common complaint is pain and stiffness in the bottom of the heel. The heel pain may be dull or sharp. The bottom of the foot may also ache or burn. This can be painful and make walking more difficult. The pain may develop slowly over time, or suddenly after intense activity. Plantar fasciitis develops because of repeated small tears to the flat band of ligamentous tissue that connects your heel to the bones of your toes. These tears weaken the arch that supports the foot. As the arch of the foot weakens, increasing strain is placed on the deeper ligaments and tendons of the foot and lower leg. Over time, Plantar Fasciitis can result in Chronic Pain, Heel Spurs and Degenerative Joint Disease (Arthritis). Plantar fasciitis is seen in both men and women. However, it most often affects active men ages 40 - 70. It is one of the most common orthopedic complaints relating to the foot. Plantar fasciitis is commonly thought of as being caused by a heel spur, but research has found that this is not the case. On x-ray, heel spurs are seen in people with and without plantar fasciitis. • Stiffness or tightness of the arch in the bottom of your foot. Physicians typically treat Plantar Fasciitis with anti-inflammatory drugs and steroid injections. These medications temporarily reduce the pain associated with Plantar Fasciitis but do not treat the cause of the problem. Traditional methods can usually take between 9 months to two years to resolve this condition. Dr. Berry’s program utilizes the latest FDA Cleared Lasers, and combines them with other therapies to help reduce the pain, strengthen the muscles around the foot and ankle joints, and increase range of motion. The Class IV K-Laser is at the heart of our treatment program. It provides a safe, effective, non-invasive, painless solution for plantar fasciitis. Patients respond exceptionally well to treatments and usually notice significant pain relief after just a few treatments. Permanent correction of Plantar Fasciitis requires two procedures. Ending the pain caused by Plantar Fasciitis requires stopping the cycle of inflammation. This is critical because chronically inflamed tissues block the flow of needed nutrients and oxygen to surrounding muscles and joints. The advanced CLASS IV K LASER restores the flow of nutrients and oxygen to the inflamed tissue allowing the cells to repair themselves at an accelerated rate. Most cases of plantar fasciitis are resolved very easily with Class IV K laser Therapy alone; however, if the condition has become chronic this can lead to alterations in the gait that will have to be addressed. This could involve stabilizing the arch with orthotics, braces, splints or implementing a simple series of specific strengthening and stretching exercises. Plantar fasciitis when treated early has an exceptionally good prognosis with our protocol. We encourage those with Plantar Fasciitis to seek our help right away. The longer one suffers with this painful condition the more likely it will cause other conditions in the knee, hip and spine. 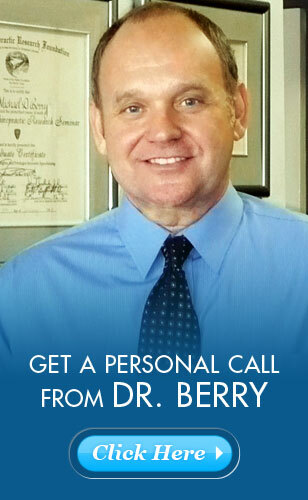 Dr. Berry has been treating sports injuries for over 35 years and has been helping people suffering from various conditions during that time. Patients seek his advice and care if they want to avoid knee surgery or if their knee surgery was unsuccessful, back surgery, hip, shoulder or elbow surgery. He has treated patients suffering from mild to severe arthritis and other conditions that did not respond to traditional methods.